Neighbors for Kids (NFK), “Golf Fore the Kids” Annual Charity Event at Chinook Winds Golf Resort was a big success! 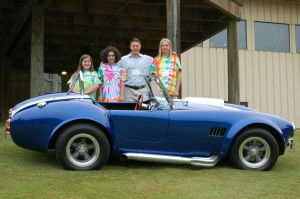 From left, Taft Elementary School students, Megan Jensen-Walker, 10, and Mercy Diamond, 11, join Neighbors For Kids Executive Director Toby Winn and Taft High 7-12 student Bear Jackson, 13, during Saturday’s tournament, where participants tried to win this Shelby Cobra by making a hole-in-one on the 210-yard 18th hole. “LINCOLN CITY – Golfers from high school teens to elderly civic leaders took their swings Saturday for the betterment of area youth at the fourth annual “Golf Fore! The Kids” charity tournament at Chinook Winds Golf Resort. The tournament, hosted under gorgeous playing conditions by Neighbors for Kids (NFK) to primarily benefit its Kids Zone summer and after-school program, brought together players of all skill levels for a morning of golf and afternoon of lunch and fundraising. We are very proud and grateful for the community support this year for the 4th Annual Neighbors for Kids, “Golf Fore the Kids” charity tournament event! This year we had 21 foursomes as compared to 11 last summer. It was also an honor to have top golfers from each of Lincoln County School District’s four high schools – Taft, Newport, Toledo, & Waldport… Chinook Winds Golf Resort sponsored 16 high school golfers this year to play in the tournament. The Neighbors for Kids mission is to support the community’s K-12 youth with our signature after-school program, “Kids Zone,” including summer educational enrichment camp. Other programs include Youth Entrepreneurship, a collaboration with Oregon Coast Community College, and expanded programs in academics, art, science, music, literacy, and information technology. We share a unique health and wellness partnership with “Catch Kids Club” from Samaritan Health Services as well as outside and inside recreational activities. Students love to attend Neighbors for Kids following regular school hours. We offer the opportunity for K-12 students to use their creative abilities to broaden skill sets in arts, science, and gain an extra academic edge during normal school hours. Our community needs a place for kids to go after school, which can be the most healthy and productive time of the day for children to engage in educational enrichment and teamwork with peers. A midday healthy food snack is provided with the support of the USDA. We have the finest professional staff along with a highly passionate and dedicated board of directors who work hard to make programs sustainable for the long term. My commitment to Neighbors for Kids as a board member and vice chair the last four years has been the best work of my life! We have many volunteers with strong skill sets who help us year around. The local retired community of supporters and stakeholders is a huge asset, coming to NFK after long and successful careers in business and education. We give our very best as mentors and stewards of one of the most outstanding non-profit after-school programs in Oregon and the Pacific NW. High standards of excellence in best practices and leadership make us as a team and community very proud. Kids are clearly our most precious resource and we must do everything we can as a community to provide all of our children the very best education as they develop into healthy, responsible, and contributing adults. This entry was posted in Uncategorized on August 2, 2013 by stevesparks.